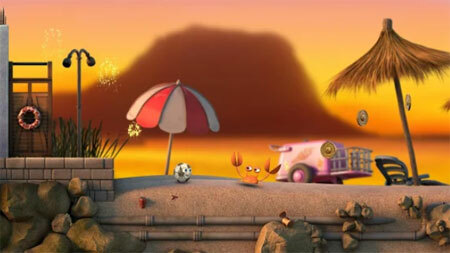 Luca: The Dreamer is a puzzle platformer developed by Creasaur. Step into the wacky and wonderful world of a football named Luca on a once-in-a-lifetime adventure. Overcome tricky challenges in this puzzle platformer and help Luca achieve his dreams. See famous cities of the world as you’ve never seen them before. Explore every corner of the hand-crafted globe brought to life with high quality graphics. Luca is a football, who enjoyed playing with the kids in the suburbs of Rio de Janeiro, until the day his life changed forever. He jumped out of the window and that’s how the adventures of little Luca began. Now he has to overcome all obstacles in his path and solve puzzles to reach his goals and travel from country to country to reach the World Cup final. He believes that nothing can stop him from achieving his dream. Stretch your fingers and prepare for a breathtaking adventure with this brave ball. The game features imaginative, hand-crafted level design. Enjoy various special moves and power-ups such as wall jump, super speed and double jump. If you get stuck in the game, check out the video walkthrough and gameplay for the game. This entry was posted in Android Games, iOS Games, Mobile Games, Walkthrough and tagged Luca: The Dreamer Cheats, Luca: The Dreamer Game, Luca: The Dreamer Gameplay, Luca: The Dreamer Guide, Luca: The Dreamer Hints, Luca: The Dreamer Review, Luca: The Dreamer Solutions, Luca: The Dreamer Strategy, Luca: The Dreamer Tips, Luca: The Dreamer Walkthrough by Marvin. Bookmark the permalink.